Surekha Niwas is a residential development of Surekha Builders. Located in Bhubaneswar, it is built across a wide area. These luxurious 1BHK, 2BHK and 3BHK apartments makes it a dream home to everyone. These apartments are beautifully crafted with modern amenities and is approved by ORERA. In which area is Surekha Niwas located?The project is situated in Hanspal, Bhubaneswar. What is available flat size in Surekha Niwas? Flat sizes in the project range from 500.0 sqft to 1380.0 sqft. How much is area of 1bhk in Surekha Niwas? 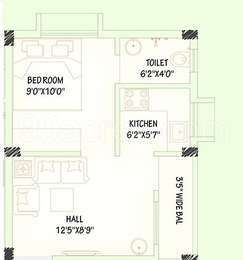 The area of 1BHK units in the project is 500.0 sqft. What is the area of 2 bhk in Surekha Niwas? The size of a 2BHK unit in the project is 1150.0 sqft. What is the area of 3 bhk in Surekha Niwas? Three-room units (3BHK) in the project are available in an area of 1330.0 sqft to 1380.0 sqft. What is the 3 bedroom price in Surekha Niwas? The project offers 3 BHK units within Rs. 3990000 to Rs. 4140000. Bed Room doors / Toilets/ Dining balconies etc. s. Some of their notable properties in Bhubaneshwar are Surekha Vatika, Surekha Regency and Surekha Niwas.